This last Saturday, 26th January, 2019 was an exciting one at our training centre, White House in Lagos. A lot of secrets were revealed in just a single day. You see, to be successful in life is really not difficult. Most of the time, the distance between where we are and the next level of our success is simply information. With the right information, you can fly higher than you could ever imagine. Right there at the class, participants were given form to start there grant applications. It wasn’t just about theory. Then, at the Loan Mentorship Forum, several possible loans were discussed and interested members had started forming group to approach some moneylenders for some quick loans. But the participants on Saturday were also fortunate to see the honey we harvested from MeritChoice Agric Villa on Friday, 25th January, 2019. They saw the real and raw honeycomb directly from the farm. They also witnessed some of our beekeepers making money the same day by selling some of their honey. Interestingly, a lot of the participants instantly pick interest to go into beekeeping. Who doesn’t want to make money with ease? Of course there is nothing as good as running the only known naturally automated agribusiness called beekeeping. Okay, enough of past report. What I know you may probably want to know is if there is another chance to participate in any of these our wonderful programmes and income opportunities. . 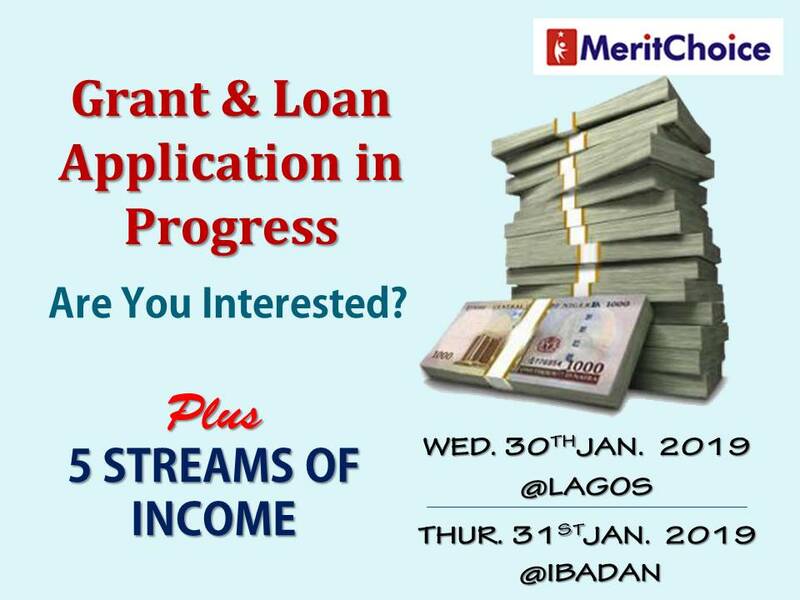 Yes, there is another opportunity coming your way this Wednesday, 30th January, 2019 at Lagos and on Thursday, 31st January, 2019 at Ibadan where we shall be exploring more about grant, loan and powerful income opportunities. Let me whisper this secret to your ears. Do you know that there is a loan already approved by Central Bank of Nigeria (CBN) to support Micro, Small and Medium Enterprises? We will be talking about 5 Streams of Income you should tap into in 2019 and of course #90DaysToMillion idea will be shared with you. Plus, there will be discussion of the business you can do to get CBN approved loan. Let me also remind you that if you need assistance to fill the current available grant, you will need N10,000.00. Please, understand that the grant is free. But there are technical details you probably will need assistance for. Therefore, make sure you prepare to participate after the introduction. I don’t want it to be like last Saturday when some were claiming they were not informed about what it takes to participate after they got fascinated about the opportunity. The Loan Mentorship Forum (LMF) is going to N10,500.00 to become a member, but you can still join the forum for N5,500.00 for this week alone. There are lot of things you will only be able to learn and know about loan from this forum. Just plan along for this too. Yes, I promised that I would ensure than some of the participants leave our training centre riding home with executive cars after last Saturday’s training. It really happened. About 4 persons went home with air-conditioned cars without paying a dime for it. They were picked from the training centre to their different respective locations. Unfortunately, many didn’t prepare very well to get the free ride. Some phone was down. Another person did have ATM to activate and some other reasons too. Therefore, if you are joining my training at Lagos or Ibadan and you need the free ride, make sure you prepare for it. Come with android phone that you can download an app andwith your ATM card to activate the free ride. No, money will not be taken from the card but it is important to have small amount of money on the card. I will explain how the idea works on the seminar day. In fact, you can be getting the free ride every time, just like I do. E-Commerce Training – How To Sell Your Products Online Without Hawking Them On The Street – Thursday, 31st January, 2019. We will be having our money-maker e-Commerce training class on Thursday, 31st January, 2019. This is where you will learn how to sell any of your products online without hawking them on the street. It’s always a great class. You don’t even need to have any product to start and we will show you how you can start selling online. You don’t need to sit at one corner of a street and start complaining “no market”, there is plenty market online. Your customers are waiting to see your product online and buy from you. The seminar comes up this Thursday at White House, Lagos. Our trainer is an expert in this area and he makes over N200,000 (two hundred thousand naira) monthly simply selling online without having a single product of his own. In case you can’t come for the live seminar, you can participate with the Online Version. I can assure you that you will get the same result just like those that participate in the live class. Just make payment and you will have instant access to the online video to start your training.